It never fails. Every time my family walks in the door, home from school and work, and our “big red pot” is in the oven…they all come sniffing their way to the kitchen, wondering what smells so awesome. That gorgeous piece of hardworking Le Creuset definitely has a higher calling than most kitchen pieces, cranking out one incredible meal after another, all perfectly tender and irresistible. My latest offering from the big red pot, Shandy Braised Chicken with Mushrooms and Green Olives, involved my favorite piece from the chicken, the thigh. Big and meaty and dark, it’s always been my very first choice. I like to use beer and hard cider when braising. And with summer rolling around, I always make sure there’s some shandy in the fridge (You’ll find Leinenkugel’s Summer Shandy and Curious Traveler Shandy in there!). The lemony beer is just the perfect summertime refresher. And now I know that it makes one wonderful pot of tasty chicken, too! My whole family loved this meal. From the moment they opened that front door, they could tell supper was going to be somethin’ special. 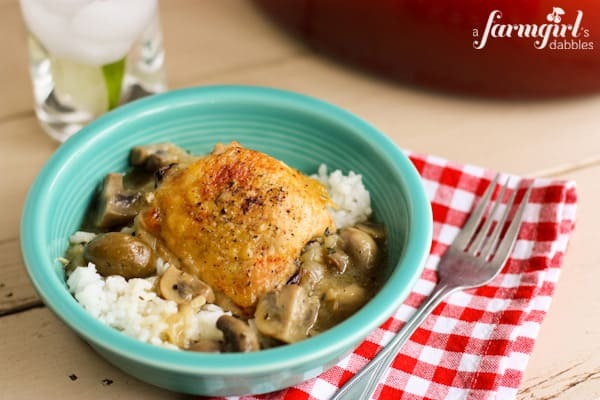 The chicken is braised in bright and flavorful shandy, with a whole bunch of mushrooms and a handful of big green olives. Together, they give this dish big depth and flavor. Then, when the chicken is good and tender, it’s placed under the broiler. Because chicken skin is meant to be enjoyed crispy, my friends! Don’t skip this step, it’s the final great detail. Rinse the chicken pieces and pat dry with paper towels. Place on a plate and sprinkle fairly generously all over with kosher salt and pepper. On the stove top, set a 6-3/4 quart oval French oven over medium to medium-high heat. When the pot is warmed up, coat the bottom with the canola oil. When the oil is hot and shimmering, place the chicken, skin side down, in the pot and let it cook, without moving it, until the skin is nicely browned. This should take about 8 to 10 minutes. Transfer chicken to a plate and set aside. Add onions, garlic, and mushrooms to the pot and cook, stirring, until softened. This should take about 10 to 15 minutes. Stir in olives, thyme, the teaspoon of kosher salt, and a few good grinds of fresh black pepper. Then pour in shandy. Stir to release browned bits on the pan bottom. Let mixture come to a boil, then rest the chicken pieces on top of the mushroom and green olive mixture, taking care to not submerge the chicken skin under the liquid. 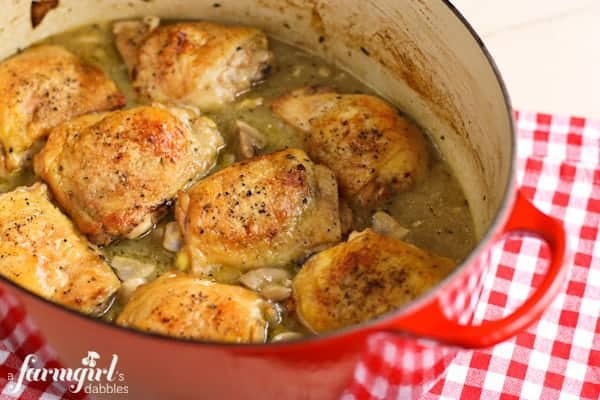 Transfer pot to the oven and cook for 35 to 45 minutes, depending on the size of your chicken thighs, until meat is tender and cooked through. Remove pot from oven. With tongs, remove chicken pieces to a roasting pan. Set pot back on the stove top over medium-high heat. Bring to a boil. 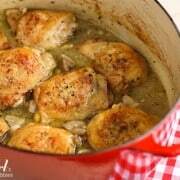 In a small bowl, whisk together chicken broth and cornstarch and stir into the boiling liquid. Turn heat down a bit, keeping a very low boil, and let liquid thicken and reduce for about 10 minutes. While liquid is reducing, move oven rack up under the broiler and turn on broiler. Place roasting pan with chicken under the broiler until skin is perfectly browned and ultra crispy. Remove from oven. Stir lemon juice into the liquid in the pot. Then taste and adjust with additional salt and pepper, if desired. 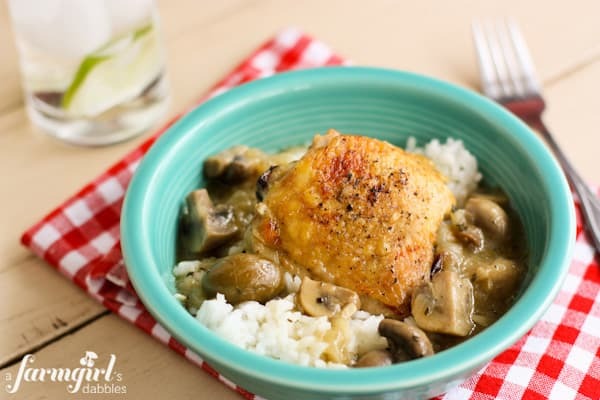 Nestle the crispy chicken pieces on top of the mushrooms and green olives and serve immediately. This is really good over rice. This beauty, the 6-3/4 quart oval French oven from Le Creuset, is truly one of my favorite pieces in our kitchen. Our family has enjoyed many awesome meals from it. 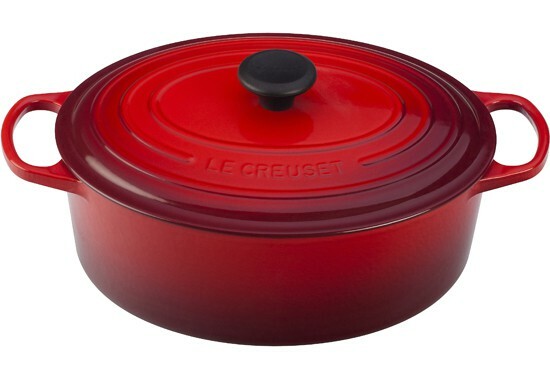 And I’m so happy that Le Creuset is giving one away right here, to one of our readers. The winner gets to pick the color of their choice, yay!! To enter this giveaway, use the Rafflecopter widget below! Please check out more from Le Creuset on their website, twitter, facebook, Pinterest, and Instagram! Giveaway rules: This giveaway is open to US residents 18 years and older. Giveaway will end at Midnight CST on May 14th, 2013. One winner will be chosen at random and then notified by email. Winner will have 48 hours to respond and claim their prize, or another winner will be selected. A farmgirl’s dabbles and Le Creuset are not responsible for lost or undelivered emails. Disclosure: I was provided with Le Creuset product for review. All opinions expressed are my own (I’ve loved Le Creuset for years!). To read the full disclosure of this site, please go here.